To mark the start of a week of dinosaur and fossil themed learning, children in Year 2 at Southglade Primary School (Nottinghamshire, England), were given the opportunity to wear their favourite dinosaur T-shirt to school. Some children had brought in dinosaur costumes, others had their faces painted, so the Everything Dinosaur team member who spent the morning with the two classes felt very much at home. Whilst talking through the learning objectives for the dinosaur workshops with members of the enthusiastic teaching team, our expert remarked on how spacious and well-organised the classrooms were. There was lots of evidence of various challenging fiction and non-fiction based writing projects on display, hopefully the suggestion about children in class 2HD having a pet Triceratops and what adventures it might get up to might inspire these budding young palaeontologists to write a short story about a dinosaur visiting their school. 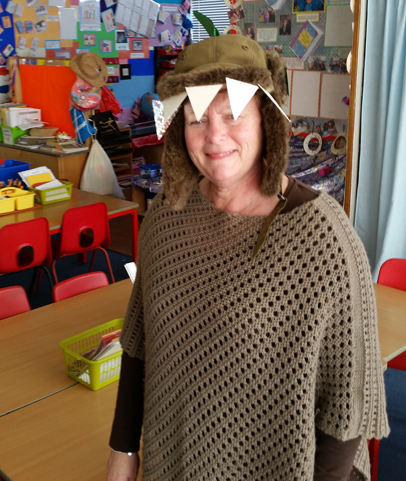 Teaching Assistant Mrs Walker had got into the spirit of the scheme of work by converting a hat into a dinosaur, how very creative. Can the children work out whether this dinosaur was a carnivore or a herbivore by examining the triangular and very sharp-looking teeth that Mrs Walker had cleverly added to her dinosaur themed headgear? Mrs Walker with her dinosaur hat. Under the dedicated tutelage of the enthusiastic and creative teaching team the children in classes 2E and 2HD are bound to have lots fun whilst learning a great deal about prehistoric animals over the next few days. Mrs Walker had even added some big green eyes to her dinosaur hat. Can the children come up with a name for this dinosaur, how about “hatty-saurus”! A big-eyed dinosaur with spikes. The green spikes located on the head (also known as the skull, as discovered by Year 2 today), are very impressive and we love the big eye. All to soon, it was time to leave, but we provided a dinosaur themed measuring exercise for the children to try, plus a novel extension activity that involves using some everyday materials to measure just how large a Tyrannosaurus rex could be. Once back at the Everything Dinosaur HQ there was just time to send out some emails with dinosaur drawing materials and fact sheets to help support the learning objectives. One of the most exciting things about collecting dinosaur models is being able to swap views and feedback on the figures. One of the best places out there to do this on the whole of the “world wide web” is the YouTube channel of JurassicCollectables. How appropriate then, on the night of the Academy Awards (the Oscars), for Everything Dinosaur to announce that the UK-based mail order company has teamed up with the super talented film makers at JurassicCollectables! Jurassic Collectables have operated a YouTube channel for the best part of seven years. 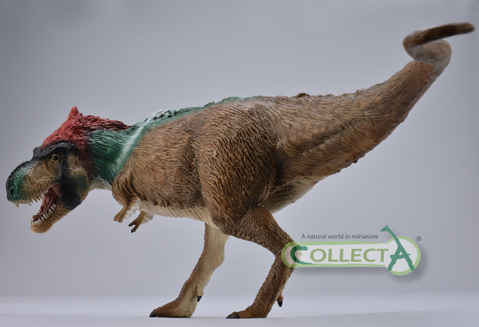 With over 46,000 subscribers and some 30.5 million views, this has certainly become the go to place for collectors and dinosaur fans to catch up on the latest prehistoric animal model introductions. Take for example, the review of the new for 2016 Schleich Dilophosaurus model, one of the latest additions to our own Schleich product portfolio. Great lighting, enables this replica to be shown off in all its glory and we love the attention to detail that the video reviewer shows, just like the attention to detail shown in the actual skin texture on the Dilophosaurus itself. Now that’s an accolade for the hard-working team members at Everything Dinosaur, perhaps it’s time for us to take a curtain call! Tonight, Hollywood might be abuzz with the Dolby Theatre hosting the 88th Academy Awards but check out the JurassicCollectables YouTube channel for some super dinosaur themed videos. An Oscar for best picture perhaps? It has proved more difficult to trace than the pattern of osteoderms on the giant, armoured back of Glyptodon but thanks to a new study published in the journal “Current Biology” scientists have been able to establish that Glyptodonts nestle well and truly within the family tree of modern armadillos. It had long been suspected that these heavily armoured animals, many of which possessed fearsome, spiky tail clubs, were closely related to extant armadillos, but this new research, based on the analysis of 12,000 year old mitochondrial DNA extracted from a Doedicurus fossil, identifies them as a subfamily with the armadillos. Good old “pestle tail” has a home. The picture above shows a model of the Glyptodont called Doedicurus (D. clavicaudatus), by Safari Ltd. Doedicurus was one of the larger representatives of this group of strange prehistoric animals that originated in South America. At over three metres in length and weighing in at approximately 1,400 kilogrammes, this herbivore was around the size of a Volkswagen Beetle car. Earlier studies based on the shape of fossil bones indicated that the Glyptodonts were members of the Xenarthra Order. A group of mammals that includes anteaters, sloths and armadillos, but there were considerable anatomical differences between members of this Order, which led to confusion as to how closely related to the armadillos the extinct Glyptodonts were. That large, dome-shaped shell, (carapace) certainly resembles that seen in modern armadillos, but it lacks the articulation. However, it was a fragment of fossilised carapace, believed to come from a Doedicurus that roamed some 12,000 years ago that has unlocked this mystery. Scientists from the National Centre of Scientific Research (CNRS) and Montpellier University in France in collaboration with colleagues from McMaster University (Ontario, Canada), were able to reconstruct the entire mitochondrial genome based on computer modelling that could predict likely mitochondrial DNA sequences. The researchers had to develop RNA probes capable of identifying potential genetic material from the target species from within the heavily contaminated fossil sample. Possible ancestral sequences were plotted against the genomes of present-day Xenarthra (sloths, anteaters and armadillos) and slowly and surely the composition of the mitochondrial genome of Doedicurus was pieced together. Phylogenetic analysis places the glyptodonts firmly in the Armadillo family. The picture above shows a phylogeny and molecular timescale of extant armadillos including the extinct glyptodont Doedicurus sp. (in red). The resulting phylogenetic analysis places the Glyptodontinae as a subfamily but a distinct lineage within the Cingulata (armadillos). The closest living relative to the giant glyptodonts according to this new research, is the Pichiciego, otherwise known as the Dwarf Pink Fairy Armadillo (Chlamyphorus truncatus) an inhabitant of the grasslands of central Argentina. Ironically, the Pichiciego, is the smallest species of Armadillo alive today, with adults rarely measuring in excess of twelve centimetres long and weighing around 120 grammes, that’s around 1,160 times lighter than the giant Doedicurus! Study suggests the Dwarf Pink Fairy Armadillo is closely related to the giant Doedicurus. This research has wider implications when it comes to piecing together the evolutionary relationships between long extinct animals and their modern relatives. This ancient DNA identification and mapping technique pioneered in this research can help unlock and reconstruct a range of other ancient genomes, allowing scientists a much better understanding of the diversification, evolution and radiation of vertebrate species. The Papo dinosaur word mats featuring Stegosaurus, Triceratops, Velociraptor and Tyrannosaurus rex have proved so popular with teachers that Everything Dinosaur has added a further two word mats to this free to download teaching resource. The Papo Spinosaurus and the huge Papo Brachiosaurus now feature in this colourful word mat series, enthusing primary school children about dinosaurs and helping to increase their confidence with language and develop their vocabulary. These word mats, once downloaded from Everything Dinosaur’s dedicated schools website, can be laminated and then stuck on the classroom tables. With six in the series there are plenty to go round. These dinosaur themed word mats can be used in lots of ways. For example, if one is given to each table then the children can be encouraged to learn about their particular dinosaur, a great way to enthuse the class about carrying out independent research and independent learning. Can the children find out facts about their very own dinosaur? Can they make a science poster all about what they have discovered? The word mats feature individual dinosaurs with various body parts labelled. Teachers could blank out these labels and ask the children to provide the information themselves. Perhaps, they might even be able to add a few new ones of their own. A pronunciation guide is incorporated into each word mat. Great news for teachers and teaching assistants as this means no more struggling with difficult dinosaur names. The geological periods that make up the “Age of the Dinosaurs” are also provided along with a handy timeline. The silhouette of the dinosaur provides an indication as to when the dinosaur featured on the word mat lived. A Papo Brachiosaurus dinosaur word mat. Everything Dinosaur has added a cute and very cuddly Dodo soft toy to the company’s soft toy range. Although not a dinosaur in the strictest sense, (would you believe an avian-dinosaur)? The Dodo soft toy is a very welcome addition to the range of dinosaur and prehistoric animal soft toys. With its shiny black eyes, bright yellow beak and little wings, this soft toy Dodo is suitable for children from three years of age. Even extinct animals need love to! The soft toy Dodo stands an impressive thirty centimetres tall and it is made from very soft material indeed, one might even say that this is a super-soft, soft toy. The Dodo, scientific name Raphus cucullatus was a member of the pigeon family. Growing to the size of a turkey, it was the largest type of pigeon known. Based on contemporary descriptions and notes from scientists who had the opportunity to study this bird before its extinction, the Dodo is described as being chubby with a rounded body covered in grey coloured feathers. The head and beak were naked of feathers, the bill was large and the mouth could open surprisingly wide. The legs and feet were yellow and this bird moved rather slowly and clumsily. Contemporary reports suggest that this bird gave a loud squawk when alarmed. Sadly, as any budding young palaeontologist will tell you, within a century or so of its discovery by Dutch sailors on the island of Mauritius, the Dodo was extinct. The reason for its demise remains uncertain. It had been thought that visitors to Mauritius had killed the bird for food, but there are numerous accounts of the bird’s flesh tasting “oily” and being very unpalatable. More likely, rats, pigs and cats introduced to the island by European settlers devastated the Dodo population by destroying nests and eating young birds and eggs. In 1693, the French explorer and naturalist Francois Legaut visited the last known refuge of the Dodo on the East Indian island. He found no trace of Dodos. This comical-looking bird has become a symbol for extinction, hence the phrase “as dead as a dodo”. The Dodo had died out in less than one hundred years after mankind encountered it. We hope you like our Dodo soft toy, it is rather lovable! 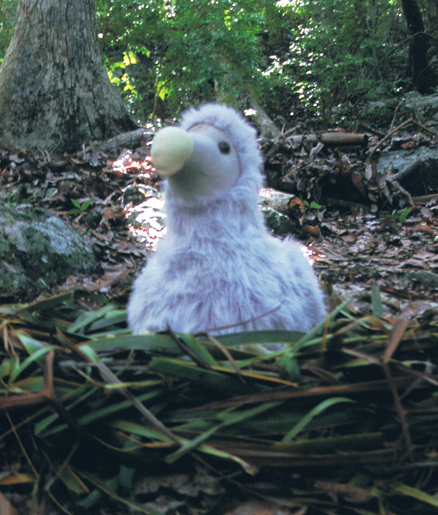 A soft toy Dodo sitting on a nest. Children in Class One and Class Two at All Saints’ Church of England Primary School (Stockport, Cheshire), have started the second half of the spring term with a real roar! These two classes are studying dinosaurs, fossils and life in the past with the help of their enthusiastic teachers Mrs Noble and Mrs Manning. Although the term topic has only just started, the classrooms have lots of lovely dinosaur themed writing on display. 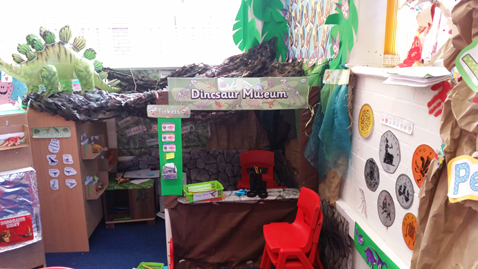 In Mrs Manning’s Year 1 classroom, a dinosaur museum has been set up, perhaps some of the measuring activities we suggested after our workshop might feature amongst the children’s exhibits. The dinosaur museum in Class One. We noticed one of Everything Dinosaur’s inflatable dinosaurs on display in the dinosaur museum – it is an inflatable Stegosaurus! As Mrs Manning confessed that her favourite dinosaur was another type of armoured dinosaur, an Ankylosaurus (pronounced an-KEE-loh-sore-us), the workshop format was altered slightly to allow the children to explore the size and scale of prehistoric animals using Ankylosaurus. We were even able to compare our brains to the brain of this plant-eating, Late Cretaceous giant. When asked to describe the size of the huge Ammonite fossil, the children came out with lots of fantastic adjectives, the Ammonite was described as “colossal”, “gigantic”, “massive” and we even had “enormous” – all super adjectives that impressed the Everything Dinosaur expert who was leading the workshop. Over the course of the morning the classes learned lots of amazing dinosaur facts, with the teachers taking many photographs, all of which could be used in the recounting and recall activities scheduled for the afternoon. With the dedicated support of the teaching assistants the children had been sorting dinosaurs into herbivores and carnivores. Reece had been colouring a drawing of a marine reptile, an Elasmosaurus (ee-las-mo-sore-us). He confidently told our dinosaur expert that Elasmosaurus was a Plesiosaur. Reece and his Elasmosaur drawing. For one of the extension resources, we challenged the children to have a go at designing their very own dinosaur. Perhaps, some of the dinosaurs that the children create might have long necks like Elasmosaurus, or even flippers, that would be a very intriguing dinosaur indeed! Could the children make a dinosaur model using modelling clay or perhaps building bricks? If the children create their very own dinosaur, we would like to see lots of lovely adjectives used to describe their design, in addition, could they come up with a name to describe their prehistoric animal? Feathered dinosaurs turn 21 years old next year and to mark this event, a major dinosaur exhibition is coming to Nottingham (East Midlands of England), in 2017. Although, the concept of feathered dinosaurs is now very well established, it was just twenty years ago, back in 1996, that the first, non-avian dinosaur species with evidence of fuzzy feathers was described. Named Sinosauropteryx this lithe meat-eater literally “rocked” scientists as the long-awaited proof of feathered dinosaurs was revealed to the world. Sinosauropteryx fossils showing “fuzzy” covering. The feathers, little more than a fuzzy integumental covering were too short to allow Sinosauropteryx to fly, they very probably helped to keep this little Chinese dinosaur warm. Whatever, the role, this was the ground-breaking discovery that helped change how the dinosaurs were viewed. The dinosaur exhibition coming to Nottingham will be hosted at Wollaton Hall, (Wollaton Park, Nottingham), with a satellite display at Nottingham Lakeside Arts. The exhibit will tell the story of the evolutionary relationship between Theropod dinosaurs and modern birds, you might think differently about the feathered friends in your own garden, after all, that Starling sitting on the bird table is a distant relative of Tyrannosaurus rex! One of the highlights amongst the extensive fossil collection on display will be the massive Gigantoraptor (Gigantoraptor erlianensis), regarded as the biggest feathered animal known to science. Gigantoraptor was as tall as a giraffe! Feathers used for display and courtship. The beautifully preserved and spectacular fossils will be on loan from the Palaeozoological Museum of China, Shandong TianYu Museum and from the Dinosaur Museum of Erlianhaote (Inner Mongolia). In addition, to the feathered dinosaurs, there will also be specimens of other Asian dinosaurs in the touring exhibit, all organised in a three-way partnership between the University of Nottingham, Nottingham City Council and the Institute of Palaeontology and Palaeoanthropology based in Beijing. Other dinosaurs to feature will include the flying dinosaur Microraptor and other close relatives of the fearsome Velociraptor. This is a rare opportunity to view dinosaur fossils that do not travel outside of China that often. In the Chinese calendar, 2017 will be the year of the Rooster, which is highly appropriate considering the subject area being covered in this exhibition. We would advise all dinosaur fans not to “chicken out” but to make a date in their diary to see the feathered dinosaurs up close. What a great way to celebrate a 21st birthday! Team members at Everything Dinosaur are busy preparing for the arrival of the next set of new CollectA prehistoric animal models. The new for 2016 replicas are due to arrive at the end of March, or possibly the first week of April. We are expecting a number of new models, including the splendid Metriacanthosaurus (M. parkeri) model. Metriacanthosaurus, pronounced met-tree-ah-can-tho-sore-us, is known from a single, fragmentary skeleton excavated from a site approximately one and a half miles north of the Dorset town of Weymouth (Jurassic Coast of southern England). The holotype material is currently stored in the Oxford Museum of Natural History and team members at Everything Dinosaur have been researching and writing a fact sheet on this English prehistoric animal. The exact locality of the fossil remains is debated, however, most palaeontologists assert that the fossils, which include two thigh bones, come from the clays located at Jordan Cliffs. What is not debated, is the age of the material as one of the dorsal vertebrae associated with the specimen had the fossilised remains of an oyster attached to it (Gryphaea). The species is diagnostic of the uppermost layer of the Oxford Clay Formation (Early Oxfordian faunal stage of the Jurassic). The Gryphaea species associated with the fossilised remains of Metriacanthosaurus is Gryphaea dilatata. A scale drawing of the Theropod dinosaur Metriacanthosaurus. As far as we at Everything Dinosaur are aware, Metriacanthosaurus is the only Theropod currently recognised from the upper Oxford Clay Formation. The name translates as “Parker’s moderately-spined lizard”, as the dorsal vertebrae possess relatively tall neural spines. The species name honours the English 19th Century anatomist and zoologist William Kitchen Parker who has been credited with the original fossil discovery. Its classification within the Theropoda remains uncertain. When originally named by the German palaeontologist Friedrich von Huene in 1923, it was called Megalosaurus parkeri. However, in the late 1920’s and early 1930’s many German scientists were being heavily influenced by the work on North African dinosaurs by Ernst Stromer von Reichenbach. The tall neural spines were reminiscent of the much more prominent spines found on the dorsal vertebrae of Spinosaurus (S. aegyptiacus), a dinosaur named by Stromer in 1915, whose fossils were being continuously studied. No other member of the Megalosauridae had such large neural spines and so the genus assignment was questioned. It was suggested that this English dinosaur should be associated with the spinosaurids. In 1932, von Huene concluded that it should be placed within the genus Altispinax, which was known from Germany. The problem was the fossil material from Weymouth represented an animal that lived at least 25 million years before Altispinax. It was not until the 1960’s that a separate genus – Metriacanthosaurus was erected (Alick Walker, 1964), more recent studies have attempted to place this dinosaur more accurately within the phylogeny of the Theropoda. Metriacanthosaurus has been placed within the sinraptorid clade. If Metriacanthosaurus was a member of the Sinraptoridae family, then it would the first European member of this mostly Asian family of meat-eating dinosaurs to have been described. The lack of cranial material makes positive identification at the taxonomic level difficult, the fossil material ascribed to this dinosaur consists of elements of the pelvis (a partial right ilium), vertebrae and elements of the hind limbs but the bones are severely cracked and distorted. A study of a Titanosaur tail bone, found in Brazil’s southern state of São Paulo has provided scientists with a rare glimpse of dinosaur disease. The caudal vertebra reveals not one but two tumours in the bone of a huge herbivorous dinosaur that roamed this part of South America around 90 million years ago. One tumour has been identified as a homoplastic osteoma, a bone overgrowth, growing over another piece of bone. The second tumour, only revealed when the homoplastic osteoma was subjected to a CT scan, is a hemangioma, a vascular tumour most likely caused by an abnormal collection of blood vessels. Tumours identified in dinosaur tail bone. The picture on the left shows the partial centrum of the Titanosaur vertebra. The black circle shows the location of the tumour and the central picture is a highly magnified image of this part of the tail bone showing the structure of the homoplastic osteoma. The CT scan image (top right) reveals the location of the second tumour a hemangioma. It is rare to find evidence of such pathology in dinosaur bone, finding two different types of tumour in the same bone is exceptional. This is the first documented case of a tumour being found in a dinosaur that is not a Hadrosaur. Both tumours were likely to be non-cancerous and benign, the plant-eating dinosaur was probably unaware of them. A number of fossil specimens reveal signs of injury or trauma, the University of Manchester has been undertaking extensive research to examine how dinosaurs recovered from injury. This research has revealed how tough the lives of some dinosaurs were. Finding evidence of disease within fossils of dinosaurs is rare, although back in 2009, Everything Dinosaur reported on a study of Tyrannosaur fossil bones that revealed evidence of a parasitic infection. The Titanosauridae family are members of the Sauropoda, the group of long-necked herbivorous dinosaurs. They were the last type of Sauropod to evolve. Likely to have been related to the Jurassic brachiosaurids, they tended to have broader hips than other members of the Sauropoda (hence the wide-gauge reference to Titanosaur tracks). With a world-wide distribution, some genera are believed to have been the largest terrestrial animals that ever lived. Estimates of maximum body size vary but weights in excess of seventy-five tonnes and body lengths exceeding thirty metres have been suggested for some exceptionally large individuals. Such bone growths and pathology can provide scientists with a valuable insight into the lives of individual animals, whose remains have been preserved in the fossil record. A few years ago, Everything Dinosaur reported on the discovery of the partial fossilised remains of a huge marine reptile that suffered from arthritis. The Tyrannosaurs are perhaps the best known clade of dinosaur. However, despite their popularity and the fact that dinosaurs such as Tyrannosaurus rex seem to be a source of endless fascination for most people, children especially, how these meat-eaters evolved into the giants of the Late Cretaceous remains a controversial area for most palaeontologists. In the light of new fossil finds, Dr. Steve Brusatte from the School of GeoSciences (Edinburgh University) and Associate Professor of Biology at Carthage College (Wisconsin), Thomas Carr, have re-assessed their earlier 2010 study and produced a new family tree that plots the evolution of the Tyrannosaurs. Plotting the T. rex family tree. More than half of all the Tyrannosaurs known to science have been identified in the last ten years or so. Everything Dinosaur has reported on many of these exciting discoveries within this blog for example, in 2011 we featured the discovery of Zhuchengtyrannus and in 2013 we discussed the implications of the discovery of Lythronax from western North America. In 2014, we wrote an article about a very peculiar member of the Late Cretaceous Tyrannosaur family – Qianzhousaurus sinensis. With new Tyrannosaurs to include in the study, the researchers re-examined their Tyrannosaur family tree that had been constructed using a dataset of morphological characteristics (parsimony analysis). In addition, a new technique of assessing the probability of phylogenetic relationships between genera was applied, the first time such an analysis had been conducted on the Tyrannosauroidea – Baysian analysis. This form of statistical analysis was first outlined by the 18th Century English statistician Thomas Bayes (circa 1701 to 1761). It involves a complex mathematical application that updates the probability of a relationship between characteristics based on the amount of evidence to support that inference available. The diagram above illustrates the result of the parsimonious study. The Baysian analysis produced a very similar result. These two techniques reinforce the conclusions made by each. In the scientific paper, the scientists argue that these methods provide a robust framework for interpreting the evolutionary history of the Tyrannosaur family. They conclude that the bauplan of the Late Cretaceous Tyrannosaurs, those apex predators with their massive bodies, and huge heads, evolved in a piecemeal manner. They also support the idea that Tyrannosaurus rex may have been an Asian migrant to Laramidia. The most famous dinosaur of all, probably came from Asia, the ancestral line leading to the “tyrant lizard king” was not home grown in North America. T. rex was an Immigrant from Asia – Chinese Takeaway Anyone? 1:40 scale model of a feathered T. rex. In addition, this study suggests that the Tyrannosaur family had a global distribution early in their evolutionary history and from the dataset, it seems that three distinct clusters of Tyrannosaurs can be identified (numbers 1, 2 and 3 in the parsimonious analysis above). 1. A basal clade of Proceratosauridae members – mostly small-bodied genera with elaborate cranial crests and a diverse global distribution in the Middle Jurassic to the Early Cretaceous. 2. An intermediate cluster of mostly small to mid-sized genera, predominately from Asia, but with representatives in Europe and the United States (Late Jurassic to Early Cretaceous). 3. A cluster of the large, apex, super-predators from the very Late Cretaceous that includes the Tyrannosauridae family and their closest relatives. In addition, to providing an in-depth study of the existing fossil record, the paper’s authors reaffirm a fundamental problem restricting our understanding of the evolution of the most famous dinosaurs of all. There are three distinct gaps in the Tyrannosauroidea fossil record. If these three, very significant gaps get filled as more fossils are found then this would represent a huge step forward in our knowledge regarding the evolution of these dinosaurs. They even may provide an opportunity to speculate more accurately on how this clade may have evolved should they have been fortunate to escape the end Cretaceous mass extinction event. What are the Three Gaps? Oh for more from Appalachia! Despite the wealth of Tyrannosaur fossil material recovered from the land mass to the west of the Western Interior Seaway (Laramidia), very little is known about the Tyrannosaurs that roamed the much larger landmass of Appalachia that lay to the east of this seaway. Only two taxa have been described to date – Dryptosaurus and Appalachiosaurus. It is very likely that many more different types of Tyrannosaur roamed Appalachia, but questions remain unanswered. Specifically, did the super-sized, tyrannosaurids only evolve on Laramidia and not Appalachia as well? Did Appalachia become a sort of “lost world” a refuge for the more primitive tyrannosauroids such as Dryptosaurus and Appalachiosaurus? In the absence of fossils, little is known about the meat-eating dinosaurs from Appalachia. Secondly, there is a huge gap of at least 20 million years (perhaps 45 million years), between the intermediate second cluster which for the moment ends with Xiongguanlong and the large-bodied, later Tyrannosaurs that were to dominate food chains in the Late Cretaceous and become the apex predators. Xiongguanlong baimoensisa was a lightly-built, agile predator some five metres in length. Its fossils are known from northern China (Gansu Province) but the strata from which the fossil material comes from has proved to be exceptionally difficult to date. Thirdly, current thinking suggests that there were many more tyrannosauroids from Late Cretaceous Asia than have been identified to date. North America shows a high Campanian faunal stage diversity of Tyrannosaurs, but in Asia all but one taxon is from the later Maastrichtian faunal stage. It is very likely that there was a rich assemblage of Campanian Tyrannosaurs in Asia too, but the fossil evidence has yet to be found. Hopefully, in the next decade or so, more Tyrannosaur fossil discoveries will be made, allowing scientists to “plug the gaps” when it comes to Tyrannosaurus rex and its relatives. Brusatte, S. L. and Carr, T. D. The phylogeny and evolutionary history of tyrannosauroid dinosaurs. Sci. Rep. 6, 20252; doi: 10.1038/srep20252 (2016).